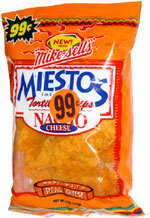 Taste test: These are similar to your standard Nacho Cheesier Doritos. They're good, but probably not quite as cheesy as Doritos. The chips seem to be slightly larger than Doritos. A good snack, with a cool name. Smell test: Very mild cheese smell. 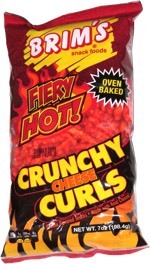 This snack was discovered by Jeremy at Speedway gas station, Indianapolis. Review published .